Please join us for this fun and challenging 15K aquatic loop. All proceeds benefit Second Harvest Food Bank! $20 per seat goes to Second Harvest Food Bank. Paddlers and Rowers are welcome! The serpentine Corkscrew Slough course is about 15km in length and has 17 turns (including 9 inside of Corkscrew) to challenge you. This 'race' circumnavigates Middle Bair Island and is entirely within protected marine waters. Times range from 55 to 90 minutes. We have chosen a safe race time for this course. It is navigable only at high tides above 3 feet due to mud flats on the west end and only at certain times due to the two flow restrictors on the route. (see below). We've got you covered. In the satellite image to the right, S and F mark the Start and Finish line 500 meters west of Stanford's docks. Click on the image for more detail. For excruciating image detail of the Corkscrew course click on the image here on the right. Follow the green dots clockwise and beware inside of key junctions (circles) where the dots are orange. Your attention will be rewarded. 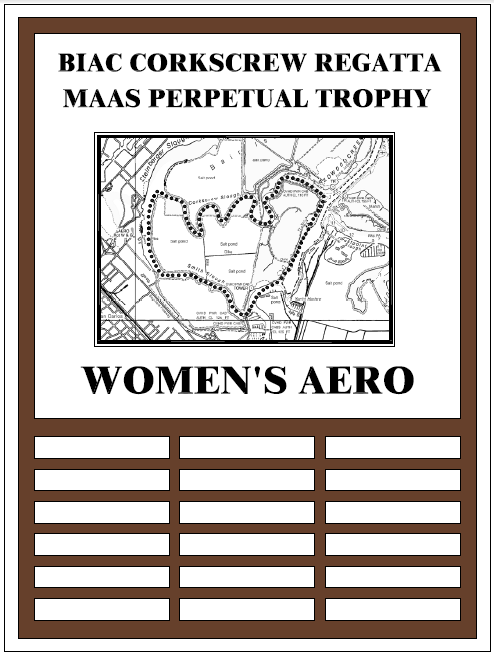 The Maas Boat Company and David Lee have created two new perpetual trophies for the 2015 Corkscrew Regatta: a Men's and Women's Aero trophy. In addition, Maas will donate $100 per trophy to Second Harvest. Thank you Dave and Maas! 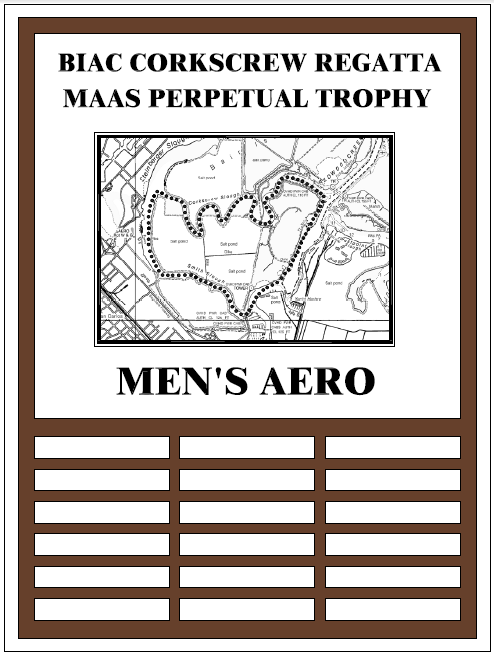 The first winner of the Men's Aero Trophy is Doug Karlson of BIAC. There were no women's entries in Feb 2015. This is a beautiful yet grueling marine obstacle course with 17 'turns'. At 15 kilometers, it is one of the longest and most challenging head-style races in the USA. We race a clockwise loop entirely within protected (weather and ecology) littoral waters. Course times have ranged from 45 minutes (K4s and quads) to 100 minutes (tourist singles). Experienced coxswains, scullers, and paddlers alike will test their wits, skill, and endurance as you navigate tight turns, flow restrictors, scenic runs, and the company of other shells. There are also numerous (yet visible) stationary markers and old dock pilings to avoid (circa Pete's Harbor, San Carlos Airport, and the Port of Redwood City). This course loop has 17 'turns', nine of which are inside of the Corkscrew Slough. More updates and details are given at the pre-race chalk talk. A practice run at high tide is advised prior to race day. Fortunately the muddy banks of this course are soft - so you won't likely damage more than your pride if you park your shell into the reeds. Start: The race begins at the start of Smith Slough about 500 meters west of Stanford's boathouse and 1000 meters from BIAC. The finish line is the same as your start. The course proceeds clockwise past the former Pete's Harbor, through Smith Slough and past the Whipple Ave loop of Inner Bair Island. In the Smith Slough straight is a flow restrictor (low dam) with a 50' opening no worse than many bridge under passes on other courses. Stay in the middle and enjoy the slightly squirrely flow. Thereafter you turn north and pass the San Carlos Airport, heading by some old harbor pilings into Steinberger Slough for a good 150 stroke stretch to approach the west entrance of Corkscrew Slough. Along the way you may notice breaches cut into the levees of Middle Bair that were made in January of 2013 to restore tidal flow into Middle Bair for the first time in many decades. Don't confuse these with the wider and more graceful entrance to Corkscrew Slough which is a few minutes past the airport and shoreline commercial buildings. 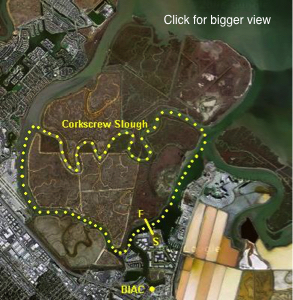 Enter Corkscrew: Stay wide here at the west entrance due to the subsurface mud flats. It is here that you'll get blocked at low tide (less than 3 feet above MLLW (Mean Low Level Water)). Once into Corkscrew you can count nine alternating turns, some hairpin (2,4) and some more subtle (1,8,9). At turn 4 you may be tempted to continue straight through a levee breach into Middle Bair. Instead, take the tight port turn with full starboard power and line up for the Corkscrew Flow Restrictor passage (pictured below). As you continue please be mindful of the sanctuary's residents: there is an abundance of wildlife to observe your style and power. Don't be freaked if a harbor seal is sighted close by (especially turns 6 through 9 where many have their home). Enjoy the ecotourism, watch your course, and keep racing. Exit Corkscrew: Your final approach to the eastern exit of Corkscrew should allow you to get in a good 100 power strokes. Stay towards the middle of the slough to avoid the power line catwalks. You emerge into the Port of Redwood City just inside of 'the wires' (500KV power towers). You are about ten minutes from the finish at red marker #14. Hug the starboard shore or run the red channel markers as you like, but stay on the right (north western) side of the channel to avoid other vessels. You'll have about 2500 meters of deep protected water before your final turn towards the finish. From there it is a nice 1000 meter paddle to cool down back to BIAC and refuel in the company of your fellow racers. BIAC holds this event once each winter, usually in December. We plan it at the first convenient weekend morning high tide. Charity: We ask for a reasonable donation per seat that goes directly towards providing meals for less fortunate families in the local area in this holiday season. We take checks or ca$h. Please make checks payable to Second Harvest Food Bank. We aim to provide meals for over 1,000 local families! All donations are 100% tax deductible between Aug 29th and Dec 31st. Dress: Bragging rights are given to crew with the best holiday costume (that you can row in). It might be wise to have a practice before hand! Registration: You may email us if you can join us or have any special needs. Actual registration (the fee gets you a bow number) takes place on Regatta Central or on the race morning at BIAC two hours before the race begins. A brief 'chalk talk' will take place an hour before the race starts in order to size up your competition and hear any late breaking course news (like weather or dredging barges). 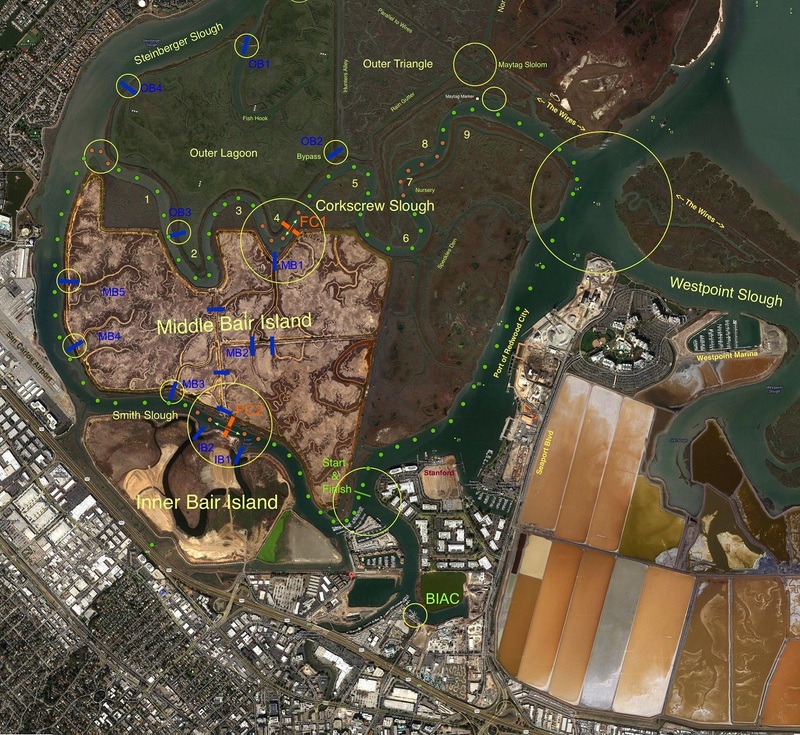 Launching: There are three great places to put shells into the waters of the Port of Redwood City - BIAC, Stanford, and the Port of RWC itself (where Palo Alto has temporary docks placed near the end of Chesapeake Drive off of Seaport and there is plenty of parking). Trailers can be kept overnight in the large parking lot at the end of Chesapeake or by arrangement at BIAC. Launch and warm up a half hour before your race time. Boats marshal west of Stanford's boathouse, which is about 1200 meters from BIAC's docks. The Start line and the Finish lines are the same, as this is a closed-loop course. It is about 500 meters west of the Stanford Crew dock in line with a wooden pole on the far (island) shore and a buoy we will place. Results: There will be an officials' launch covering safety, recording start and finish times, and judging attire near the starting line. Race results will be announced online in the afternoon ASAFP - the race committee comes in last to the potluck and deserves a moment to enjoy your company. Safety: Please ensure shells have heel ties, bow balls, etc. There will be a motor launch in the channel recording times; it will be used in the event of an emergency. There will also be competitors equipped with cell phones and one rowing 'cleanup' at the tail to ensure everyone's safe passage. And there will be safety people with sharp sticks and loud bullhorns near each flow restrictor to remind you to ease off and stay in the middle. Spectators The best place to watch this race is from Stanford's boathouse on Cardinal Way in Redwood City or the boardwalk and parking lot to the west. The new apartments on the former Pete's Harbor site have a good viewing walk too. It will be an action packed two hours as shells start and finish close together. Good viewing is available from the docks, shoreline, and from Stanford's balcony. Bring binoculars and a good hat, show up around the starting time, and watch the festivities. Pot Luck: We usually expect around 100 rowers. The fueling festivities will start about a half hour after the first race finishes and continue until about an hour after the last race finishes and the officials launch returns safely. Bring something to fun to share - that's the only guideline for now.